This week, Dispatches from the Field is excited to welcome Alannah Gallo. 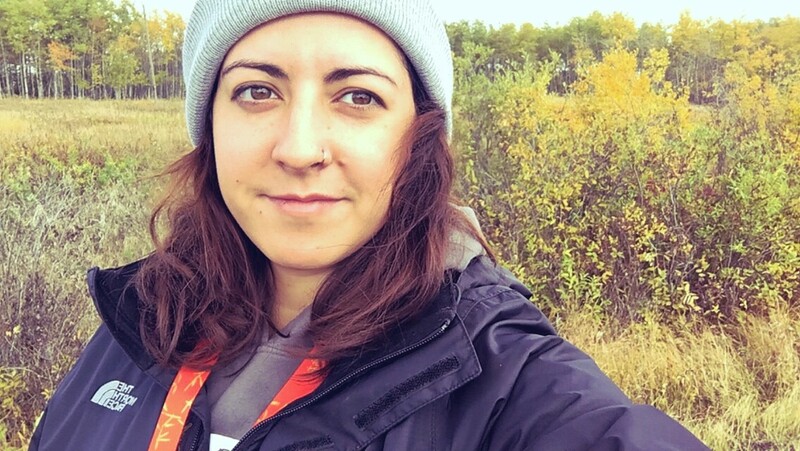 Alannah got her start in environmental consulting over the summer, and shares some of her adventures surveying both avifauna and pollinators in western Canada. As I write this, I am about to land in Winnipeg, Manitoba, for my last round of pollinator surveys of the year…and I’m so relieved I’ve made it through the field season. These past few months have been my first exposure to field work. I was fortunate to have two employers willing to share me as I worked on bird surveys for one company, and pollinator surveys for the other. Working two very different jobs at the same time and the huge learning curve that came with both was a lot to take on, but I’m so happy I did. In my bird survey position, I was fortunate to have an amazing and supportive set of coworkers to help me become a better birder. 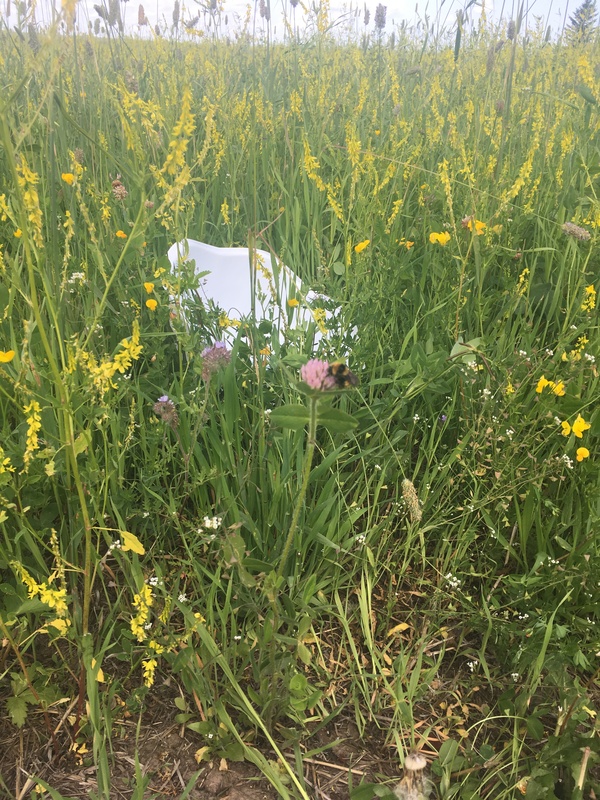 The pollination surveys, though, were a bit more challenging, as I was completely on my own for all the travelling, planning, and surveying I had to do from June to September. A pollinator visits one of the flowers grown from our seed mixes. The objective of Operation Pollinator was to measure the effect of pollinator seed mixes on pollinator diversity. 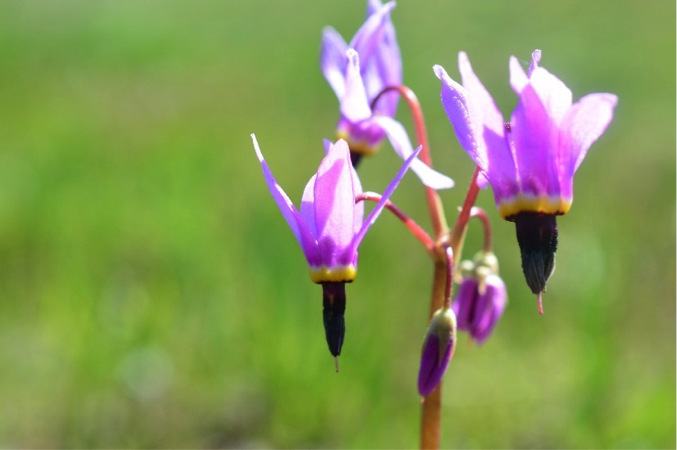 Seed mixes were sent to landowners in Northern Alberta, Manitoba, and Saskatchewan who would plant them in sites they had set aside for the project. The idea is that I would have an initial meeting with the landowners, who would show me where they had planted the seed mixes, and then I would visit these sites, along with a control site (i.e., an area where no seed mix was planted), once a month from June to September to survey for pollinator diversity and abundance. There were five pollinator sites and one control in each province, for a total of 18 sites…so it was a lot to handle. 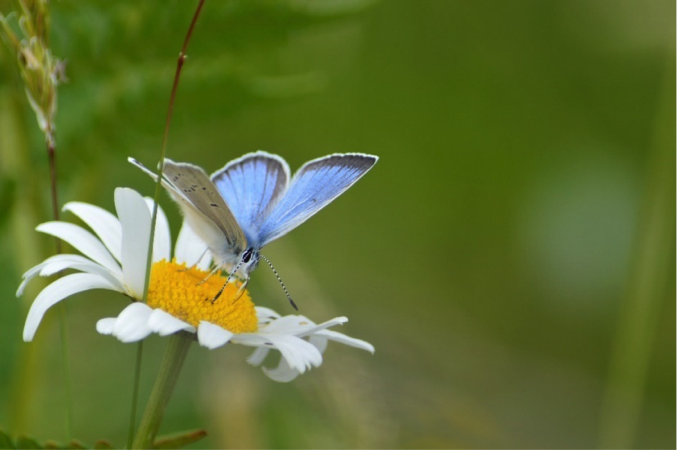 The process of surveying for pollinators is fairly straight forward. I placed pan traps, which are plastic yellow or white bowls filled with water and soap, along transects and waited for insects to fly in. (This works because pollinators are attracted to the colours yellow, and white). I also conducted net sweeps, using a bug net to sweep through the vegetation at each site. Finally, I did visual surveys – in other words, I watched what species visited the flowers from the seed mixes. A common alpine butterfly captured during a net sweep. When I got the job, it sounded totally manageable. I was eager to prove myself and set out to do what I could to prepare myself for the field work. I first studied pollinators during my undergraduate degree at the University of Calgary, where I took courses on invertebrates and entomology. Then I volunteered with John Swann, the curator of the Entomology Museum at the University of Calgary , who trained me to process and identify specimens. (One of the best things I learned from this training was how to fluff bumblebees – probably one of my favourite things to do!) Once I got the pollinator survey job, I refreshed my knowledge by reading up on the most common species of pollinator in western Canada and creating flashcards for the flowers I was told to focus on when at each of my field sites. I thought I was decently prepared, and ready to tackle this project. I was so, so, wrong. Identifying insects in the field was so much more difficult than I had anticipated. Insects at the museum were pinned and sat still, allowing me to focus, use my reference texts, and take my time. 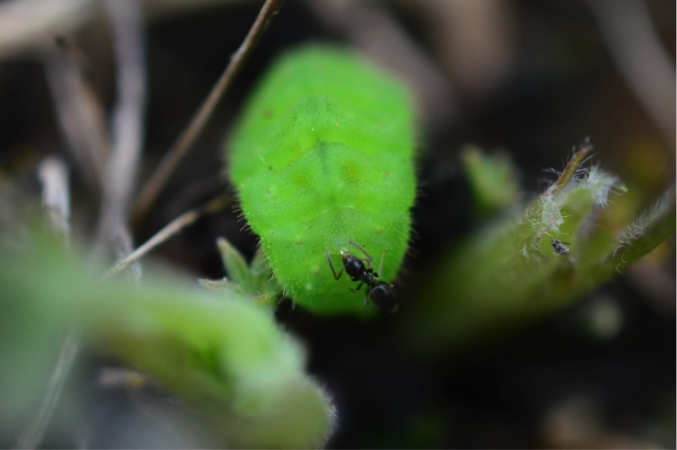 Insects in the field…not so much. I had to adapt quickly. Each month also came with a new set of organisms to ID, as both the flowers and the pollinators changed with the season. On top of that, although there was overlap, the biomes of the sites varied significantly across the provinces. In the end, I basically had to re-learn and memorize everything there was to know about pollinators…over, and over, and over again. During each day of surveying I would take photos or sketch doodles of the species I didn’t know and figure out what they were at night in my hotel. Then the next day, I would have to wake up and continue to my next sites. It was exhausting, but so rewarding. One of my favourite memories of this summer took place at one particularly beautiful (and terribly tick infested) forested site near Erickson, Manitoba in June. I had laid out my pan traps and was waiting for whatever was in the area to land in them while I conducted my visual survey. After a few minutes, I checked on my traps and was surprised to see that a beautiful Canadian tiger swallowtail (Papilio canadensis) had been attracted by the colour of the pan trap and fallen inside. I quickly reached in to pull it out, but saw that my trap had soaked and damaged its wings. It needed a safe place to rest while it dried out…so I placed the butterfly on my arm, and it sat there while I continued my work for the next 20 or so minutes. Slowly, its wings dried, and eventually I placed it in some nearby clover. At that point, it was able to fly short distances, so I hope it was okay in the end. 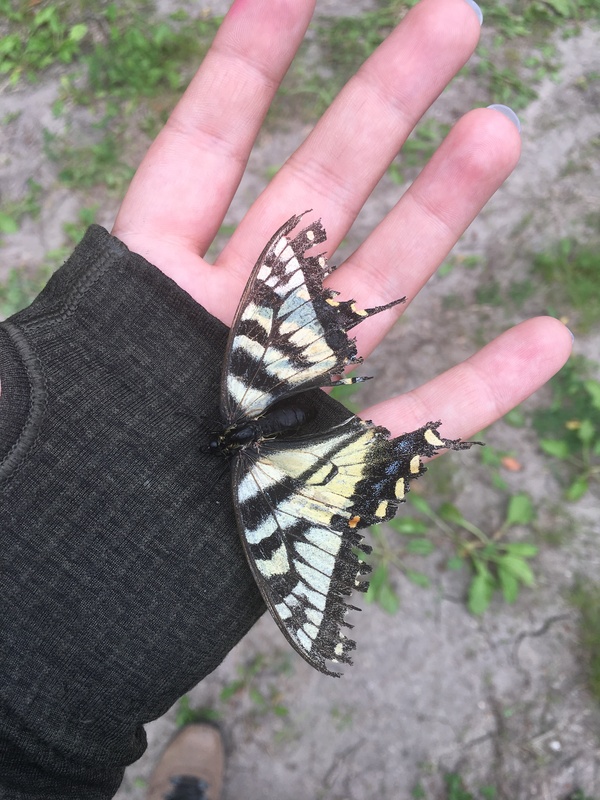 The rescued tiger swallowtail who kept me company for half an hour of fieldwork. I’ve come so far in four months, and I now have a much better feel for wildflowers and insects in Alberta, Saskatchewan and Manitoba. Considering how much I had to deal with, between managing life and working two consulting positions, I’m immensely proud of myself for handling it so well. I want to continue to pursue work in the consulting field, and so I need to become proficient at identifying birds, bees and plants. It’s an exciting journey, and I can’t wait to tackle more work next season and continue to push myself to learn and become an excellent naturalist. Alannah Gallo is a biologist who works in environmental consulting in Calgary, Alberta. She has just started her Master of Science in Environment Management at Royal Roads University in Victoria, British Columbia. With 7 species of bees being listed as endangered species this week, it is good timing to welcome a guest post by Rachael E. Bonoan, a Ph. D. candidate from Tufts University about her research with honey bees. “Anyone have to pee?” I ask loudly so that Joanna, one of my interns, will wake up. It has been a long week of long drives, made longer by the fact that the air conditioning in my 1996 Honda Accord is broken. We have finally reached the Tufts University Cummings School of Veterinary Medicine (Tufts Vet) in Grafton, MA for the third and final time this week, and the campus center is our last chance to use the bathroom before going out to the field. My Honda rocks up and down as we take the dirt road. In no time, we are at the edge of a sprawling field. Our field. I pull my Honda up to the edge of the grass and put it in park. Earlier in the week, I learned that driving across the field of tall grass is not the best idea if I want my car’s low suspension to last the summer. We step out of the car, stretch, and take in the sights and smells of Tufts Vet. Yes, smells. Our field is near one of Tufts Vet’s swine barns; we are sometimes welcomed by the smell of pigsty. It’s not a pleasant smell but it always brings me back to my childhood, when my grandparents lived near a pig farm. More pleasant though, is the smell of the dewy grass that has made early morning fieldwork worth the drive from the city. I look out into the field as we unload my car. The six beehives we have already set up are neatly tucked away along a row of trees. 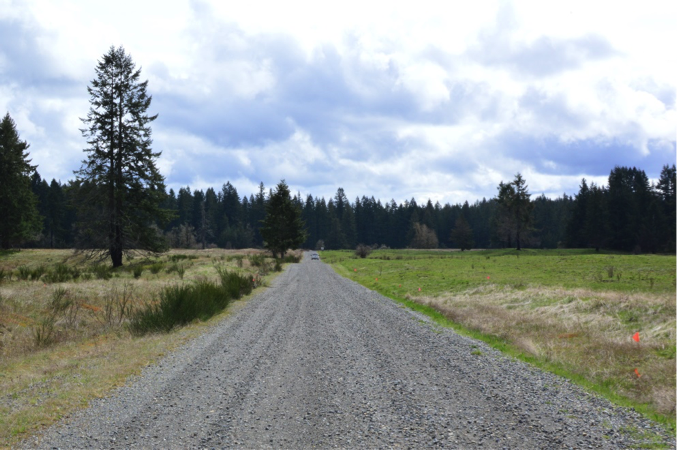 From the dirt road, you would never know they were there. 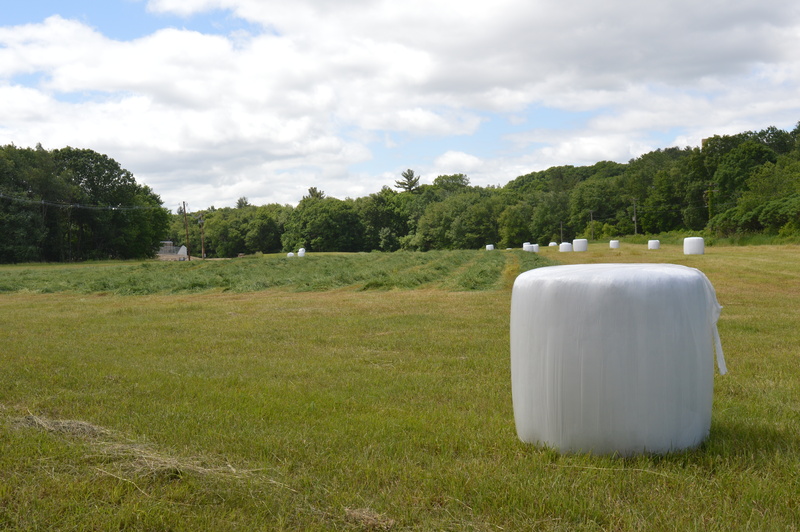 Scattered throughout the green field are large rolls of grass ready to be fed to the cows under the blue, cloud-speckled sky. Our field site at Tufts Vet in Grafton, MA. James, Joanna, and I carry our supplies to the appropriate spot among the trees and begin setting up our final three hives, making a total of nine hives ready to be filled with bees. Our week’s work complete, we return to the car for our drive back to the city. Although our hives are ready for bees, our bees will not be ready for pick up until next week. Three of our nine hives at the shady edge of the field with James and Joanna comparing notes (and my car) in the background. When the day to pick up the bees finally arrives, we excitedly return to Tufts Vet with nine small boxes of bees strategically packed into my Honda. These small boxes of bees are called nucleus colonies, or nucs. A nuc is a small colony of bees that is then installed into a larger hive. On this happy day, we traipse through the now-taller grass and place one nuc outside each hive. We let the nucs rest after the stressful drive while we head to the campus center to relieve our bladders and refuel before our work begins. Refreshed, we begin the installation. As we install the bees into their new homes, we examine each nuc to make sure there is a queen and that the colony is healthy. 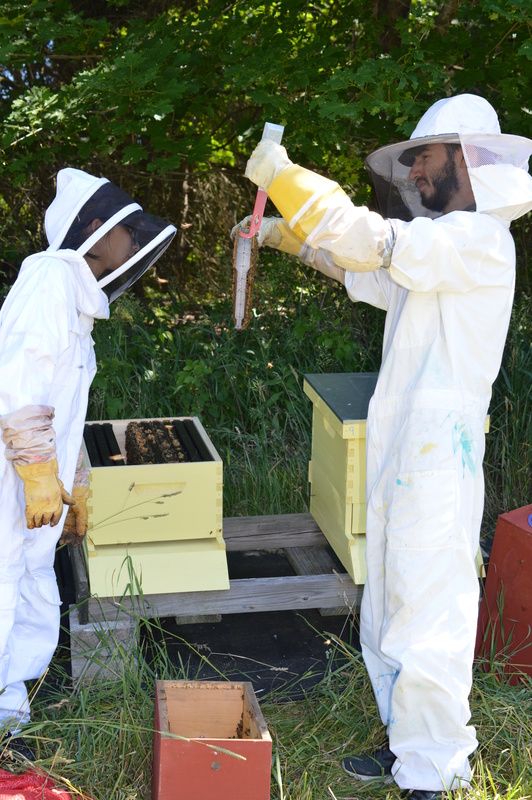 After each frame of bees is carefully inspected, we move it from the red nuc into our freshly painted yellow hive. This is James and Joanna’s first real beekeeping experience, and my first experience installing bees. We are all excited. James and Joanna inspecting a frame of bees as they install the bees into their new home. With the bees installed, we are ready to begin our experiment. For this summer’s study, we are measuring foraging effort of our hives. To do this, we sit outside each hive and count the number of bees leaving the hive in 10-minute intervals. To aid with the counting, we enlist a couple more helping hands. 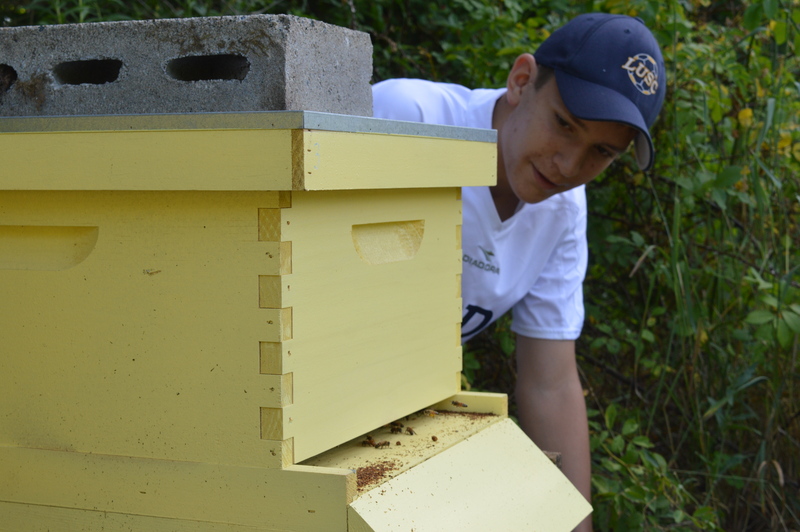 Adam, a beekeeper, budding biologist, and high school student from Lexington, MA joins us, as does Luke, a Tufts undergraduate who has been working with Team Honey Bee for over a year. I appreciate the extra help but I especially enjoy giving more young scientists a chance to experience fieldwork firsthand. Adam counting bees leaving the hive. As a kid, I loved catching and observing insects. It wasn’t until the summer before my senior year of college that I realized I could catch and observe insects as my job. 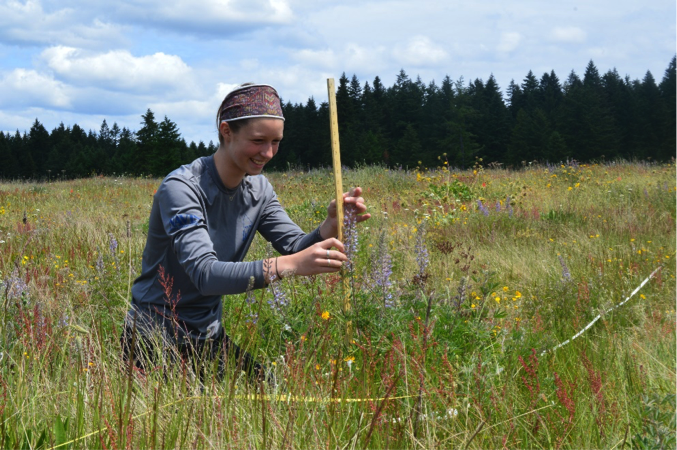 That summer, I worked with butterflies and fell in love with fieldwork. 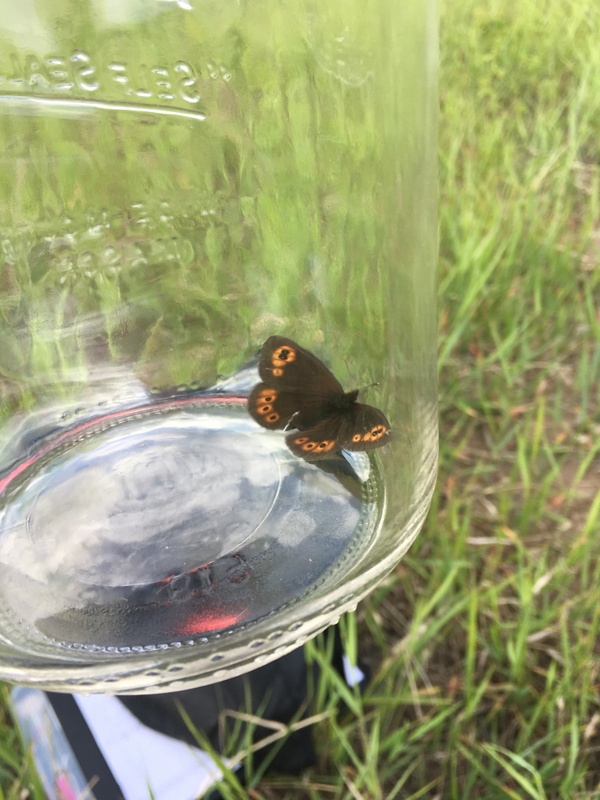 For my study, I caught butterflies in the field and raised their caterpillars in the lab. Working with the butterflies, I learned how to tell the difference between a male and female simply based on how the butterfly was flying. I learned how to gently handle the insects in order to stress them out as little as possible. I learned that fieldwork takes a tremendous amount of creativity and troubleshooting, and a lot of trips to the hardware store. But in the end, I learned that it’s all worth it. Watching my bees, I again feel this intimate connection with my study system. I can hear (and even smell!) when my bees are angry; I can identify how honey bees fly compared to other bees; I can point out which bees in the hive are the youngest just by looking at them. Although it sounds (and sometimes is) tedious, I feel true joy in our fieldwork while sitting quietly and counting bees. After all the driving and preparation, we are finally collecting data! And outside in a beautiful place no less! Sitting there in our field, watching our bees, I hear only their collective buzz and chirping birds. No cars, no sirens, no indications of the hustle and bustle of day-to-day life. Tufts Vet is truly a rural oasis for both humans and bees, and sitting there in the open field always manages to put me at peace. CAPTION: Foraging honey bees, slowed down to ¼ speed. For the play-by-play of this video, check out my blog post, Organized Chaos, at http://www.rachaelebonoan.com/blog.